"To serve as the central and premier charitable arm of the sport of bowling, the industry, and its partners worldwide, and to become a philanthropic leader toward positive social change." "To provide educational programs that encourage a healthy, active lifestyle while building confidence and teaching the values of sportsmanship, teamwork and perseverance through the sport of bowling." Assisting choice charities in the US and internationally that have appeal to society, bowlers, the industry and sport in general. By reaching out to bowlers, bowling center management and proprietors, bowling equipment manufacturers, retailers and their partners, to promote these causes, raise awareness and funding. Coordinating and/or implementing specific bowling related charitable activities. These include Special Olympics Adaptive Bowling events, providing mobile bowling lanes and equipment for disaster relief, for military troops and veterans, and to third world countries for aid and development of sport and recreation. 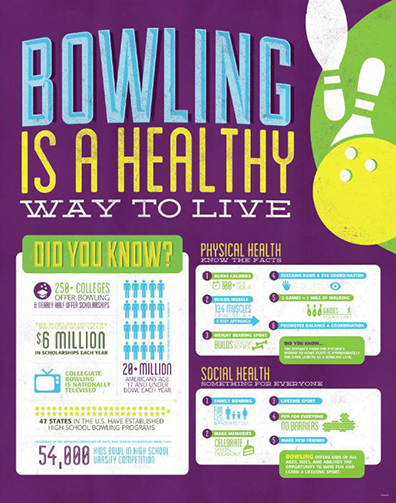 Supporting the growth of bowling through the sport’s initiatives, particularly with youth. This includes youth bowling and instruction, in school and after school bowling programs, grants offered to schools, bowling centers and other youth and recreation organizations. The Bowling Foundation also supports youth through a variety of scholarships. Ensuring the history and scope of the sport is maintained and preserved through the International Bowling Museum & Hall of Fame. Each year The Bowling Foundation awards schools with In-School Bowling equipment grants to public or private educational institutions, grades k-8; or 501 (c)3 non-profit organizations serving youth in grades K-8. Each winner receives 6 carpeted bowling lanes, rubberized bowling balls and pin, plus instructional DVDs to assist coaches and teachers introduce and instruct the game of bowling. The funding is part of the of the foundations continuing effort to help enhance lives through the sport of bowling. The Mobile Bowling Equipment program annually helps schools, parks and recreation departments, disabled and disadvantaged service groups and other organizations and youth groups purchase equipment to teach and enjoy bowling. Genesee Area Focus Fund, Flint, Mich.
Farmingdale Public Schools, Farmingdale, N.Y.
Dr. Martin Luther King Jr. Charter School, New Orleans, La. Sally Potter School, Lake Forest, Ill. Westwood Elementary School, De Pere, Wis.
Tusculum Elementary School, Nashville, Tenn. Bowling collectively provides an estimated US$50 million dollars annually to charitable causes, non profits and NGO’s. From local bowlers organizing an event, seeking pledges, conducting community fundraising programs, volunteering for charity bowling events, to experts and bowling centers providing instruction, coaching, lanes and equipment, and so many other ways of helping.